One of the highlights of our second Shorter Film Festival was Italianamerican, Martin Scorsese's 1974 documentary about his parents Catherine and Charles (If you missed it, the 45 minute film is on YouTube). 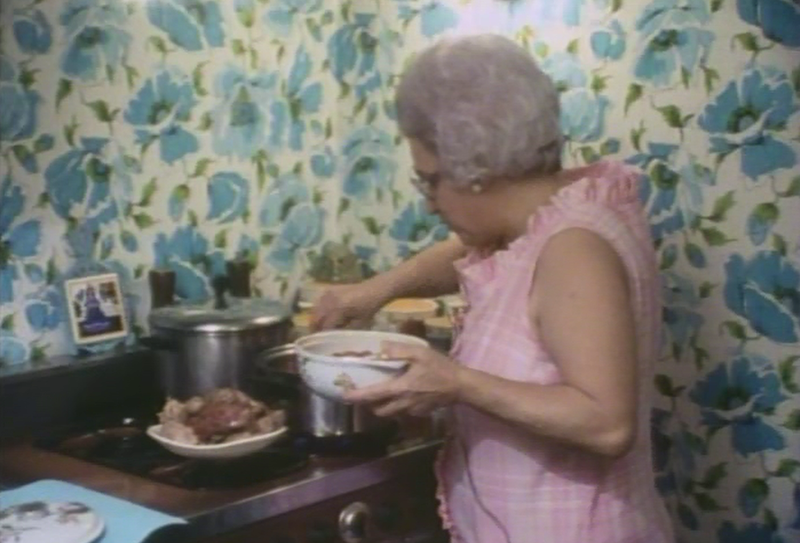 In it, Mrs Scorsese cooks up a delicious meal for her husband and son and the recipe plays over the end credits. Because we didn't see anyone jotting it down, we thought we'd share it with you here. Singe an onion & a pinch of garlic in oil. & put it on a plate. Put in a can of tomato paste & some water. through a blender & pour it in. Add salt, pepper & a pinch of sugar. Let it cook for awhile. Throw the meat back in. a few spoons of sauce. Roll them up, throw them in. Let it cook for another hour. If you want to see more of Catherine Scorsese this is her memorable cameo in Goodfellas where she cooks a late-night dinner for Joe Pesci, Robert DeNiro and Ray Liotta. This is a clip of Martin Scorsese discussing that scene with Jim Jarmusch. And if you want to see more of Marty's dad, here is in Goodfellas cooking up another pasta sauce.